If you've ever put something on the passenger seat like a bag, backpack, groceries, dog, box, mail, coat, potatoes, gallon of milk, icecream, laptop case, luggage, bag of mulch (please say no!! ), trumpet, gym bag, 2 liter or Root Beer or anything similar in size, weight or size you've likely been annoyed to all hell by the super obnoxious MINI warning sound (which by the way will chime 60 times and then start again once there is any shift in the weight/movement). As if we are not intelligent enough to know that every human sitting in a moving vehicle should be properly anchored with a seat belt! MINI feels we need to be reminded that SOMETHING is in that seat that COULD be the weight of super small child or hobbit and we should be 'ding-donged' until our ears bleed. 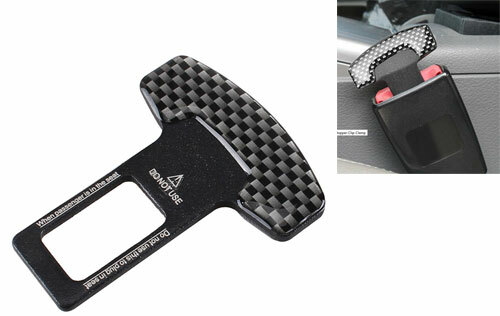 End the annoying chime sound with this simple piece of metal that is sized just like the seat belt connector which when inserted into the belt receiver makes the car think the belt IS plugged in. Doubles as a large (like silly large-but still cool) keychain when not in use. Not to be used to fool the computer if there REALLY is a person in the passenger seat! !